Minara Residency is a residential project featuring 1, 2 and 3 bedroom luxury apartments. Located on GT Road at the gateway of Bahria Town and DHA, Minara Residence provides affordable upscale accommodation to families looking for quality apartments within a self-sustaining community. Minara Residence promises to deliver an array of luxury, comfort and leisure facilities amidst peaceful surroundings. With excellent facilities such as Jacuzzi, Sauna, health club, mosque, and temperature controlled swimming pool, you will never have to go far to find the luxuries and amenities you desire. 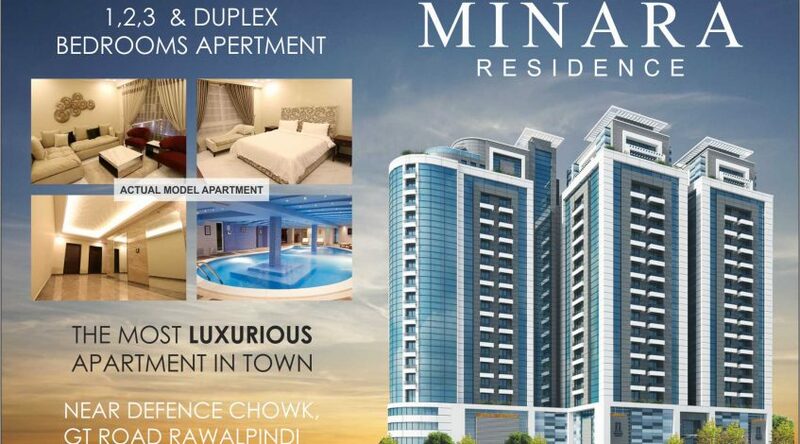 Located on Grand Trunk Road, Minara Residence is easily accessible from all parts of twin cities. It is at the gateway of DHA and Bahria Town, opposite Ayub Park; Adjacent to Fauji Foundation Hospital, benefit from the vibrant and peaceful family oriented neighborhood. Minara Residence provides the best health and leisure facilities among all residential projects in twin cities. Benefit from temperature controlled swimming pool, jacuzzi, sauna/steam, and gymnasium to enjoy a healthy lifestyle. Minara Residence offers the best living facilities with ample corridor area, semi-furnished kitchen, energy-saving electric system, fireproof system, built-in wardrobes, imported ceramic flooring, selected granite tops and much more. With these amazing features, get ready to enjoy the best living experience in twin cities.